Solitary weekends can be so lovely. You can sleep as late as you want, you can spend the entire day indoors with no reproach, you can have cold pancakes for breakfast, take long walks in the mist, and scheme about making totally-from-scratch Icebox Cake with a similarly food-obsessed blogger. You can wear the same ratty sweatshirt three days in a row, you can go from watching five episodes of Grey's Anatomy on one day to seeing La Grande Illusion the next, you can have a four-way Internet conversation for hours on end with your friends from Frankfurt, Boston and Los Angeles, and eat all the leftover vegetable tart you want. 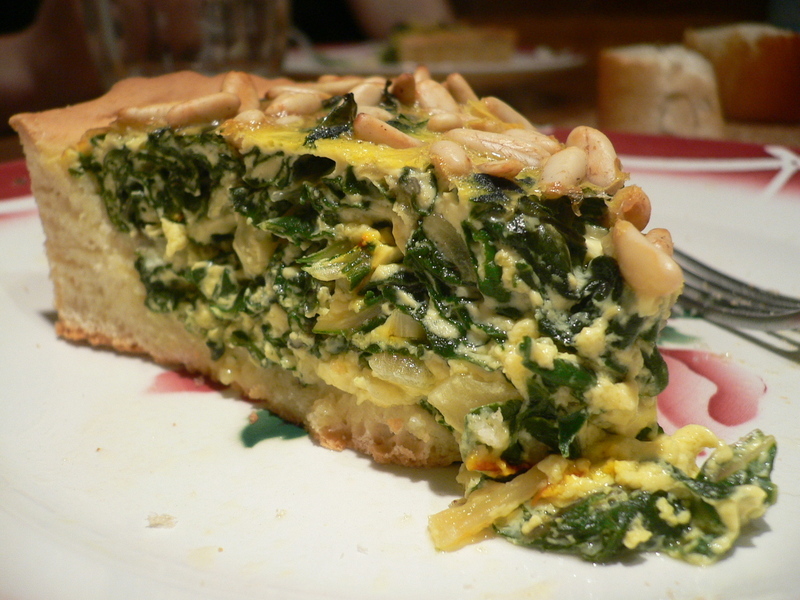 For a girl's dinner last week, I made the Swiss chard-filled tart that Russ Parsons included in his article about Phil McGrath's sustainable farming operation near Los Angeles in early December. No other recipe has seemed as mouth-watering to me as that one in recent times. The sound of the words "yeasted", "tart", and "dough" together was enough to have me yearning for the kitchen on a daily basis. Doesn't it do the same for you? The tart was a joy to put together - the dough was soft and pliable, the filling a snap. It took my oven 20 minutes longer than the recipe indicates to bake until it was properly cooked, so keep that in mind for your own ovens. The creme fraiche-enriched dough baked up into a marvelous crust that was crunchy on the outside, soft and fluffy on the inside. The filling was truly crammed with greens, and got its complexity from saffron, lemon peel (go easy on the lemon, I warn you), nutmeg and Parmigiano. The tart was gorgeous to look at, with its golden-brown filling studded with browned pine nuts, and even better to eat. But even even better than that? Eating it the next day - when the cold of the refrigerator had miraculously transformed the trembling custard into something silky and smooth, when the greens relaxed into undulating waves through each slice of tart, when I could pick up a sturdy slice and eat it at the computer, chatting with my dear friend as she showed me her pregnant belly from more than 3,000 miles away. As for the final wedge, at lunch on Sunday I drew from the fridge a Frigoverre of leftover tomato sauce (chopped onion, a few diced carrots, one can of tomatoes, fresh oregano - my grandmother's method), warmed it up and turned the sauce into a deep soup plate. I plopped the final piece of tart onto the sauce and and as the sweet flavors of the tomato sauce warmed the earthy tart, I realized that with all the blissful cheer inside, I'd barely noticed the dark gloom outside. Which really made my day. What more could I ask for? 1. Dissolve the yeast and sugar in one-fourth cup warm water (105 to 115 degrees) and set it in a warm place. 2. If the egg is cold from the refrigerator, cover it with hot water and let it sit a few minutes to bring it up to room temperature. Combine 1 cup of the flour and the salt in a bowl and make a well. Break the egg into the middle of it; add the crème fraîche and pour in the yeast mixture, which should be foamy with bubbles. Mix everything together with a wooden spoon to form a smooth, soft dough, adding more flour as necessary. Dust it with flour, gather it into a ball, set it in a clean bowl and cover. Let the dough rise in a warm place, 45 minutes to an hour. If you are not ready to shape the dough at this time, punch it down and let it rise again. 3. Flatten the dough, place it in the center of the tart pan, and press it out to the edge using either your knuckles or the heel of your hand. Add only enough flour to keep the dough from sticking. If the dough shrinks back while you are shaping it, cover it with a towel, let it relax for 20 minutes, then finish pressing it out. It should be about one-fourth inch higher than the rim of the pan. It can be filled immediately or refrigerated until needed. 1. Cut the chard leaves away from the stems and save the stems for another purpose. Chop the leaves into pieces roughly an inch square, wash them in a large bowl of water and set them aside in a colander. 2. Heat the oven to 375 degrees. In a wide skillet, heat the butter and oil over medium heat; add the onion and cook it until it is translucent and soft, about 6 minutes. Add the garlic, the chard leaves (by handfuls, if necessary, until they all fit) and the salt. Turn the leaves over repeatedly with a pair of tongs so that they are all exposed to the heat of the pan and cook until they are tender, 5 minutes or more. When the chard mixture is cooled, squeeze out any excess moisture with paper towels. 3. To make the custard, beat the eggs, then stir in the half and half, infused saffron, lemon peel, grated Parmesan, a few scrapings of nutmeg and the parsley. Stir in the chard and onion mixture. Season with more salt, if needed, and freshly ground black pepper. 4. Toast the pine nuts in a small pan over medium heat until they are lightly colored, 2 minutes. Pour the filling into the tart shell and scatter the pine nuts over the surface. Bake until the top is golden and firm, about 40 minutes.